As another waterfall guide has said, you get two waterfalls for the price of one with Licklog and Pigpen Falls. 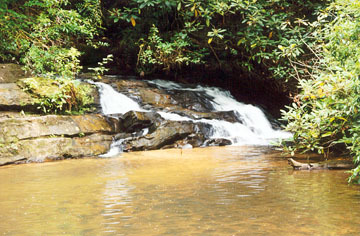 The falls occur along the concurrent Foothills and Chattooga trails near the Nicholson Ford Road trailhead. If you are looking for a great family outing, consider this easy 30-minute hike. 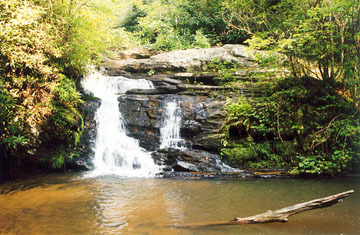 Pigpen Falls is trailside with a child-friendly sandy pool at its base. Those who want a bit of a challenge can hike a little further downstream to Licklog Falls. Seeing unobscured views of Licklog Falls require some steep climbing through thickets of rhododendron. Directions: From Walhalla, take SC 28 west for 10 miles to its intersection with SC 107 and turn right onto SC 107. Drive 3 miles and turn left onto Village Creek Road (just past Oconee State Park). Drive 2 miles and turn right onto graveled Nicholson Ford Road (Forest Service Road 775). Drive 2 miles - crossing two shallow streams and passing a large pond - until you reach a fork. Take the right fork (FS 2603) until it deadends at a parking lot. Look for the trail access on the north end of the parking lot and hike west toward the Chattooga River. The Foothills Trail is blazed white, while the Chattooga Trail is blazed black. After hiking 20-25 minutes and crossing a couple of footbridges, you will see a large, well-used camping area at the base of Licklog Creek and Pigpen Falls. Cross Licklog Creek and continue on the Chattooga Trail about 300 yards. 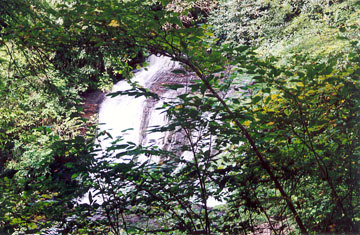 You should glimpse the first tier of Licklog Falls to the right of the trail. 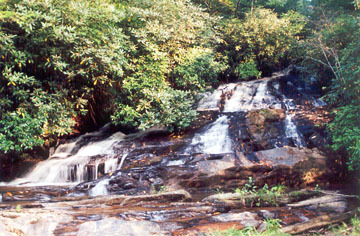 It is safest to pick a path downstream of the falls to reach the base. Once back on the trail, continue another 50-100 yards downstream and look for another path down the hillside to see the second tier where Licklog Creek spills into the Chattooga River.